This post is sponsored by Pacific Foods. 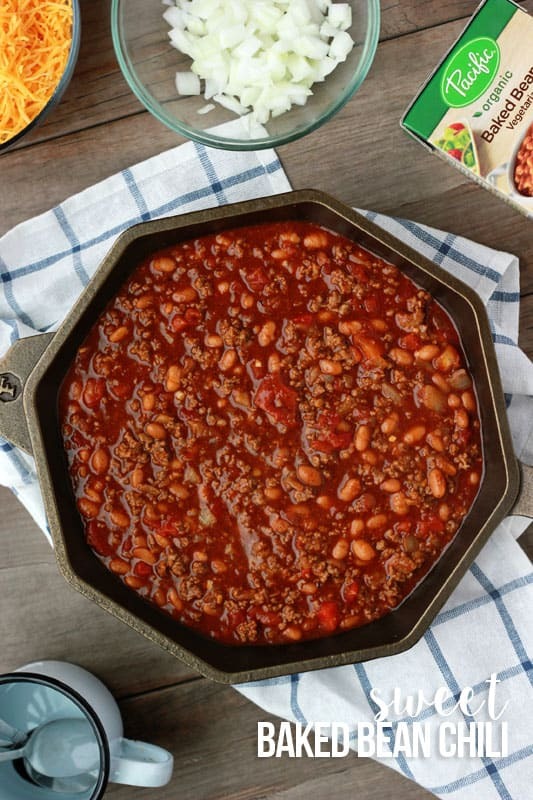 Sweet Baked Bean Chili is the perfect camping comfort food! 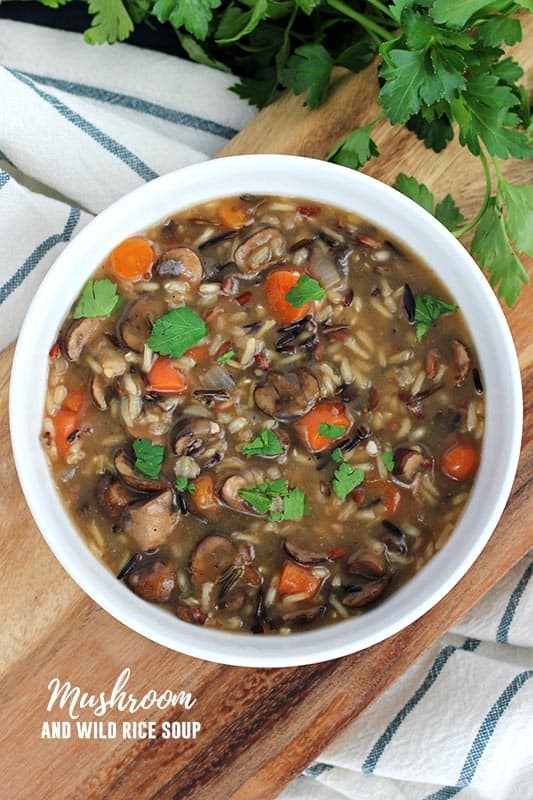 Minimal ingredients means a filling dinner is just one campfire away! If you are new here you probably should know that I am a bit obsessed with camping recipes. Waaaaay back when my blog was a baby (only a week old) we went on a camping trip and I decided it would be fun to share what we ate with all of YOU. To this day those recipes are some of the most popular on the site! I am constantly adding to the list and this recipe is about to make it to the top! It’s quick, easy, and most importantly… Delicious! I know what you’re thinking… Baked beans in a chili?? Is that girl crazy?? I’ll stop you right there and reassure you that I am not and that this recipe is to-die-for! We made it once before heading out and another time using our Finex cast iron skillet right over the open flame (thank you handy dandy fire grill) and everyone agreed that the smokey flavor you get added just the right touch. Top things off with some fresh chopped onion and shredded cheese and you will never make another chili recipe again! The secret is in the ingredients. You want a really great baked bean and one that isn’t too sweet. 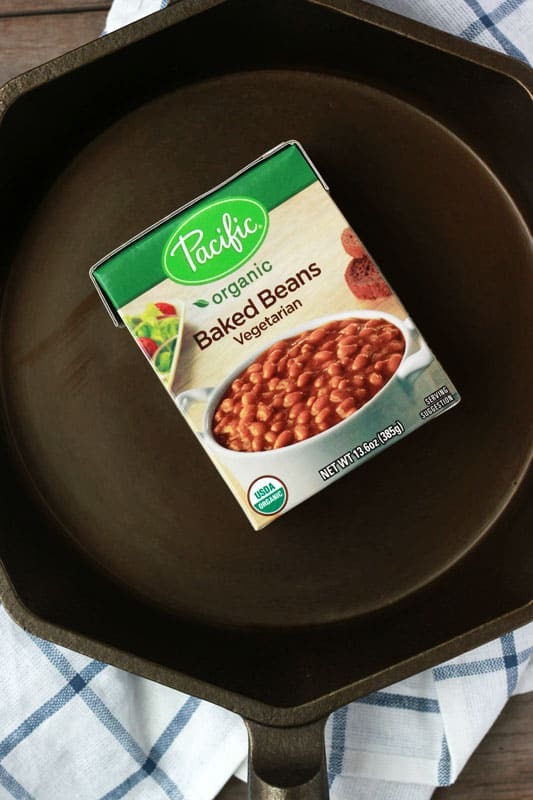 I chose the Organic Baked Beans from one of my favorite brands, Pacific Foods. It’s the brand I always reach for when looking for a tasty and easy side so it made sense to use it as the main ingredient in this chili. The sweetness isn’t too overpowering which balances well with all of the other ingredients and the innovative packaging delivers exceptional fresh flavor vs. the “tinny” taste of cans! Bonus? They have Vegan, Vegetarian, Soy Free and Dairy Free Baked Bean options to help please everyone in the family. Prep a little a head of time by chopping your onions and dividing your canned goods into Ziploc bags. Pacific Products come in easy open pouches which means you don’t need a can opener and they pack great! Add your ground beef and onion in a large preheated skillet. Cook until the meat is browned and the onion is soft. Add the remaining ingredients and simmer 10 minutes. 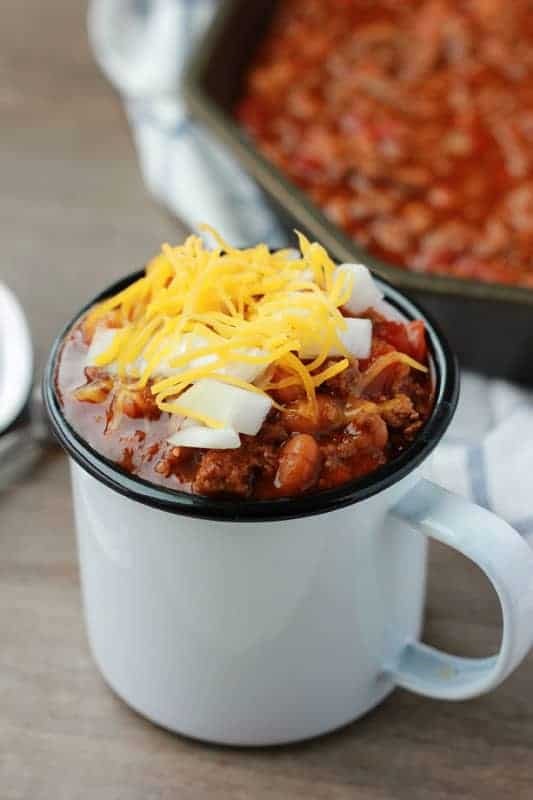 Serve with shredded cheese, sour cream, chopped onions, or any of your other favorite chili toppings! *Chop your onions before you leave for your camping trip for even easier prep when you get outdoors! * Pacific foods easy open containers are ideal for hiking and camping. No can opener required!